The Text of the Gospels: Sinaiticus and the Byzantine Text: Same Message? Seriously? Claims such as that one unrealistically minimize the differences between the Alexandrian text and the Byzantine Text, and downplay the mistakes made by copyists. Let’s test that claim, comparing the text that was written by the copyist of Sinaiticus (À) – before anyone came along later and made corrections – and the Byzantine Text as found in the Robinson-Pierpont compilation. In the interest of brevity, I will limit this comparison to the text of the Gospel of Matthew (and I will not make all the comparisons that could be made). I will add some comments, but for the most part I will let these comparisons speak for themselves. Byzantine Text: no; Asa was a descendant of David. To avoid attributing a bad error to Matthew, the person who uses sound exegetical methods will perceive that the Alexandrian Text actually refers to Asa but resorts to a non-standard spelling that happens to produce the same name as the name of a contemporary of David (Asaph) to whom several Psalms are attributed. Byzantine Text: no; Amon was a descendant of David. To avoid attributing a bad error to Matthew, the person who uses sound exegetical methods will perceive that the Alexandrian Text actually refers to Amon but resorts to a non-standard spelling that happens to produce the same name as the name of an Old Testament prophet (Amos). ● 3. In Matthew 5:22, did Jesus prohibit being angry with a brother, unless there was a reason, or did Jesus prohibit being angry with a brother, without qualification? Sinaiticus: Jesus prohibited being angry with a brother, without qualification. Inasmuch as Jesus is plainly said to be angry in Mark 3:5, those who utilize both sound exegetical methods and the Alexandrian Text are left with the task of defending the premise that Jesus was consistent with His own teachings. Perhaps their sound exegetical methods will involve considering the nuances of the Aramaic terms for “anger” that Jesus used. ● 4.. In Matthew 5:19, did Jesus affirm that the person who does what the law says, and teaches others to do so, shall be called great in the kingdom of heaven? The text of À skips the second half of the verse, very likely because the scribe of À’s line of sight drifted from the first occurrence of “in the kingdom of heaven” in the verse to its second occurrence, skipping all the words in between. Byzantine Text: yes, Jesus did this. Sinaiticus: no, Jesus did not do this. ● 6. In Matthew 7:27, did Jesus mention that “the floods came”? The scribe of À accidentally skipped the phrase due to a parableptic error (when his line of sight shifted from the letters -μοι at the end of ποταμοι to the same letters at the end of ανεμοι). ● 7. In Matthew 8:3, did Matthew mention that the leper was cleansed immediately when Jesus touched him? ● 8. Did Matthew report in 8:13 that the centurion went to his house and found that the servant had been healed? ● 9. Where did Matthew say that the demoniacs were encountered in 8:28? The reading in the Byzantine Text is supported by Origen in the 200s, before Sinaiticus was produced. “Gazarenes” (Γαζαρηνων) appears exclusively in Codex Sinaiticus. ● 10. In Matthew 8:29, did the demoniacs address Jesus by name? ● 11. In Matthew 9:15, did Jesus say, “But days will come when the bridegroom will be taken away from them”? The scribe of À carelessly skipped some text again, skipping from the first occurrence of νυμφιος in this verse to the second occurrence of the same word. ● 12. Did Matthew report (in 9:24) that the people at the home of the young girl who had died knew that she was dead? ● 13. Does Matthew 9:35 say that people followed Jesus after He healed them? ● 14. Does Matthew 10:3 affirm that Lebbaeus was also named Thaddeus? ● 15. Did Jesus tell the apostles not to provide themselves with silver as He sent them to preach in Mathew 10:9? ● 16. Does Matthew 10:12 say that Jesus told the apostles, when entering a house, to greet those within with the blessing, “Peace to this house”? ● 17. Did Matthew record (in 10:39) that Jesus said, “He who finds his life will lose it”? ● 18. Did Jesus say, in Matthew 11:29, “Take My yoke upon you, and learn of Me,” or merely “Take My yoke upon you, and learn”? ● 19. In Matthew 12:13, when Matthew described how Jesus healed the man with the withered hand, did he say that the hand that had been withered became as whole as the other? ● 20. Did Matthew say that one of Jesus’ disciples told Him, as He was speaking to the crowds, that His mother and brothers stood outside waiting to see Him? Or to put it another way: does Matthew 12:47 belong in the text? ● 21. Does Matthew 13:35 say that the prophet Isaiah wrote Psalm 72? In Matthew 13:35, Sinaiticus’ text says that Isaiah the prophet is being quoted. The quotation that is given, however, is from Psalm 78. Now, there is another passage – Mark 1:2 – where Isaiah’s name appears in the Alexandrian Text where it does not belong, and in that case, “sound exegetical methods” provide a sort of loophole, so that even though the first part of the quotation is from Malachi rather than Isaiah, eagle-eyed exegetes can perceive that Mark combined two prophetic passages, and only named the more prominent of the two; Malachi’s material being connected in a thematic way. ● 22. Did Jesus explain, in Matthew 13:39, that the harvest is the end of the age? ● 23. Did Matthew record, in Matthew 13:41, that Jesus said that the angels are “His” angels? This is an interesting reading in À, because there is no readily obvious mechanism to elicit it. Vaticanus and other Alexandrian witnesses include “his” (αυτου). ● 24. Did Jesus immediately make His disciples get in the boat after the feeding of the five thousand, according to Matthew 14:22? Like the preceding comparison, this one shows another passage in which the scribe of À seems to have arbitrarily dropped a word that was not essential to the sense of the sentence. Vaticanus and other Alexandrian witnesses include “immediately” (ευθεως). ● 25. Did Jesus send the crowds away before went up a mountain to pray in Matthew 14:23? ● 26. In Matthew 14:30, was Peter intimidated when he saw that the wind was boisterous, or simply when he saw the wind? The Alexandrian Text’s core witnesses share a parableptic error; an early copyist’s line of sight skipped from the letters -ον in ανεμον (“wind”) to the identical letters at the end of the next word, ισχυρον (“boisterous”). ● 27. In Matthew 15:31, did the multitudes marvel when they saw that the maimed were made whole? ● 28. In Matthew 16:2-3, did Jesus rebuke the Pharisees and Sadducees because they could discern the meaning of certain weather patterns, but could not discern the signs of the times? ● 29. In Matthew 17:15, did the father of the boy with an unclean spirit address Jesus as “Lord”? ● 30. In Matthew 17:21, did Jesus tell His disciples, “But this kind does not come out except by prayer and fasting”? ● 31. In Matthew 18:11, did Jesus say, “For the Son of Man has come to save that which was lost”? ● 32. In Matthew 18:12, in the parable of the lost sheep, does Jesus mention that the shepherd leaves the ninety-nine sheep upon the mountain when he goes to search for the lost sheep? ● 33. In Matthew 19:9, did Jesus say, “And whoever marries her who is divorced commits adultery”? ● 34. In Matthew 19:18, does Jesus include “Do not commit adultery, do not steal” among the commandments that one should keep? ● 35. In Matthew 19:20, does the young man say that he has kept the commandments since his youth? ● 36. In Matthew 20:7, as Jesus told the parable of the laborers in the vineyard, did he repeat the master’s statement, “And what is right, you shall receive”? ● 37. In Matthew 20:16, does Jesus say, “For many are called, but few are chosen”? ● 38. In Matthew 20:22, does Jesus ask James and John if they are able to be baptized with the baptism with which He is baptized? And does Jesus affirm in 20:23 that they will be baptized with the baptism with which He is baptized? ● 39. In Matthew 20:30, did the two blind men at Jericho address Jesus as “Lord”? ● 40. In Matthew 21:12, does Matthew refer to the temple as “the temple of God” or simply as “the temple”? ● 41. Does Matthew 22:15 mention that the Pharisees plotted how they might trap Jesus in His words? ● 42. In Matthew 23:4 did Jesus say that the scribes and Pharisees devised burdens that were “hard to bear”? ● 43. In Matthew 23:8, did Jesus forbid His disciples to be called “Rabbi”? Sinaiticus: no; the first part of the verse is absent. ● 44. In Matthew 23:35, is Zechariah identified as the son of Berechiah? This comparison is particularly interesting, because it catches the scribe of an old witness (Sinaiticus) removing a difficulty, whereas the vast majority of Byzantine scribes left it untouched. ● 45. In Matthew 24:7, what does Jesus say will happen before the end of the world? ● 46. In Matthew 24:10, did Jesus say that in the last days, many will hate one another? Sinaiticus: no. Sinaiticus, rather uniquely, says that people will hand over one another to tribulation and then verse 11 commences. ● 47. Did Jesus say in Matthew 24:35, “Heaven and earth will pass away, but My words will by no means pass away”? Sinaiticus: no; the verse is absent. ● 48. In Matthew 24:36, did Jesus specifically acknowledge that the Son does not know the day of His return? ● 49. In Matthew 25:22, does the servant address his master as “Lord”? ● 50. In Matthew 25:42, does the King tell the goats, “I was naked, and you did not clothe Me”? ● 51. As Jesus instituted the Lord’s Supper in Matthew 26:28, did He say, “This is My blood of the new covenant,” or “this is My blood of the covenant”? Although the Byzantine Text’s reference to the “new covenant” can be accounted for as a harmonization to First Corinthians 11:25, it is a very widespread and very early reading. The Alexandrian reading interlocks suspiciously well with Marcionite theology. ● 52. In Matthew 26:62, what does the high priest say to Jesus? Sinaiticus: nothing; the second half of the verse is absent. ● 53. In Matthew 26:63, does Matthew say that Jesus was silent when questioned by the high priest? Sinaiticus: no; the first half of the verse is absent. (This is the result of another parableptic error; the copyist of À accidentally skipped from “said to Him” in 26:62 to the identical phrase in 26:63, losing all the words in between). ● 54. Does Matthew 27:45 specify that there was darkness “over all the land”? ● 55. Does Matthew 27:49 state that Jesus was pierced with a spear before He died, and that water and blood came forth from Jesus’ body before He died? In Matthew 27:49 – when Jesus is on the cross, and has cried out, “My God, My God, why have You forsaken Me?” – Codex Sinaiticus includes a passage which says that one of the soldiers took a spear and pierced His side, and that water and blood flowed from the wound. After this, in Matthew 27:50, Jesus cries out again with a loud voice, and dies. This contradicts what is stated in John 19:30-34: John reports that Jesus died (in 19:30), and that the soldiers pierced His side afterwards, confirming that He was already dead. A person who applies sound exegetical methods to the text of Codex Sinaiticus cannot maintain the doctrine of inerrancy, whereas a person reading the Byzantine Text can. ● 56. Does Matthew 27:52 report that when the earth quaked and the rocks were split, the graves were opened? ● 57. Does Matthew 27:56 name Mary Magdalene as one of the women who witnessed Jesus’ crucifixion from afar? ● 58. In Matthew 28:6, does the angel invite the women at the empty tomb to “Come, see the place where He lay,” or, “Come, see the place where the Lord lay”? Byzantine Text: Come, see where the Lord lay. Sinaiticus: Come, see where He lay. ● 59. Does Matthew 28:9 begin by mentioning that “As they went to tell His disciples,” Jesus met the women? ● 60. Does Matthew 28:17 specify that when the disciples saw Jesus, they worshiped Him, or does it simply say that they worshiped? 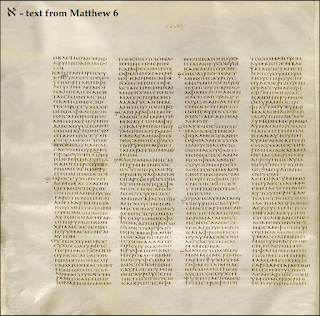 It should be obvious from this comparison that the sermons of a Christian preacher in the early church using a copy of the Byzantine Text of the Gospel of Matthew certainly would not and could not be the same as the sermons prepared by a preacher who used Codex Sinaiticus, even if their methods of exegesis were identical. Not only would they be different regarding a variety of details, but a preacher using Sinaiticus’ errant text of Matthew 13:35 and 27:49 would not reach the same conclusion about the veracity of the text as a preacher using the inerrant Byzantine text of Matthew 13:35 and 27:49. And in passages such as Matthew 5:19, 6:13, 9:15, 10:39, 12:47, 15:31, 17:21, 18:11, 19:9, 20:16, 23:8, 24:10, 24:35, and 26:62-63, the difference between what was written by the copyist of Sinaiticus and what was written by Byzantine scribes is the difference between no text and a text. Similarly, a sermon preached by a preacher using Codex Sinaiticus would differ from a sermon preached by a preacher using the Byzantine Text because the Byzantine Text does not contain the harmonizations and expansions that corrupt the text of Codex Sinaiticus in passages such as Matthew 8:13, 9:24, 9:35, 10:12, 13:35, and 27:49. The idea that anyone, however sound their exegetical methods may be, will interpret nothing the same way he would interpret something, and draw the same conclusions, is absurd. This is particularly true when one reading conveys an error and a rival reading does not (as is the case in Matthew 13:35 and 27:49). It is not my intention today to defend in detail either the contents of Sinaiticus, or the contents of the Byzantine Text (although in most of the cases I have listed, the reading in Sinaiticus is an obvious scribal corruption, disagreeing not only with the Byzantine reading but also with the reading found in the manuscript’s Alexandrian allies). 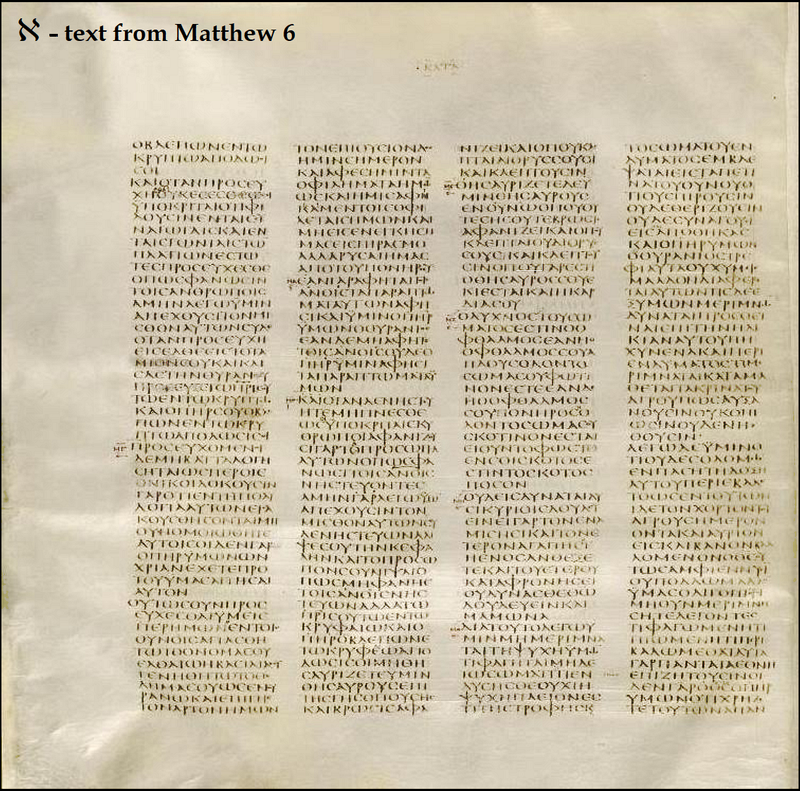 This comparison simply shows that the text of Matthew in Codex Sinaiticus and the text of Matthew in the Byzantine Text are so different from one another that they do not elicit the “very same conclusions” from their readers. Such a thing is not remotely possible. Good work James. I knew you'd have something great next time we heard from you. I appreciate it. In your list there, just a note...it is Matthew 11:29 as there is no Matt 11:39. Good to know all this, thanks. So far the Peshitta is batting a thousand. Very interesting study, James. Thanks again for what you do. I agree with Tim above. The context of White's claim was comparing the TR (dogmatic/canonical/ecclesiastic/traditional) text to an eclectic one. The argument was that the message would come out the same and all basic doctrines would come out the same regardless of which compiled text one used. He was not comparing single manuscripts. I am still getting my feet wet in all of this, so take any questions and comments I have as what they are: questions from a layman trying to figure this out. Isn't it sort of throwing off the study a little to compare only one manuscript without qualification to another text that is a Majority Text compilation rather than just another single manuscript? Thanks for your help. I am actually going through these one at a time right now to understand them better. I cannot adjust my last comment, so I wanted to correct myself. I realized you were responding to a claim in White's book, not one of his recent claims on YouTube. My apologies for that oversight. I do still wonder about comparing one manuscript to a collated Majority Text as opposed to a single Byzantine manuscript from 1,000 years later. You haven't read me say that either. Where the difference in wording is merely a matter of restating the same thing, no. Where one variant means something different than the other, they can't both be the Word of God. And certainly in Matthew 13:35 and 27:49, the reading in Sinaiticus (attributing Psalm 78 to Isaiah, and stating that Jesus was pierced with a spear before His death) is not the Word of God. Furthermore, apply whatever exegetical method you will, and you will not reach the "very same conclusions" from Sinaiticus' text of Mt. 13:35 and 27:49 that you will from the Byzantine Text of Mt. 13:35 and 27:49.